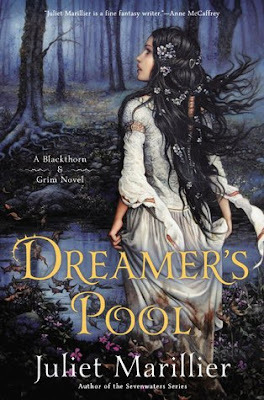 Blackthorn & Grim is a young adult high fantasy series written by Juliet Marillier. She is one of my favorite high fantasy authors even though I've yet to read all of her work. Mainly, her writing is beautiful and magical. 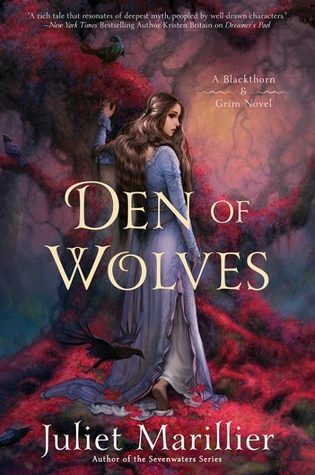 Den of Wolves, the last book in this trilogy, was published and made available this week, and so I thought, what better way to celebrate than squee about how pretty the covers for all three books are. 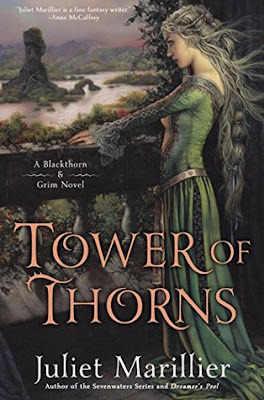 Fantasy novels tend to have a lot of really good cover illustrations, and the Blackthorn & Grim trilogy is no different. And while I've always liked most of the covers for Juliet Marillier books, I can't say that any have ever actually stood out as much to me. But the three of these covers, from the illustration to the type setting, it's all just so pretty that I can't stop looking at them. Specifically Den of Wolves--it was the one that drew my attention the fastest, more than likely because of the bold red background. The last time I started a Juliet Marillier fantasy trilogy, I breezed through one book after another and had the entire series finished in no time. So this time, I decided that I would patiently wait out the publication of the last book before even trying to get a hold of the first. I feel I've become quite impatient in my old age to wait around to finish an ongoing story, and this whole trilogy thing that's been going on is a bit frustrating sometimes.